On 1 February 1953 the combination of a spring-tide of unparalleled height and a north-westerly gale burst through large sections of dyke in the South-West Netherlands, flooding more than 150,000 hectares. 1835 people lost their lives. The disaster accelerated plans to strengthen the dykes against wind and water; by 21 February the Delta Committee was installed to formulate plans at high speed. The crux of the Delta Plan was to shorten the total length of sea wall by 700 km. by closing off four sea-arms: Haringvliet, Brouwershavense Gat, Veerse Gat and Oosterschelde. Most of the dykes in the provinces of Zeeland and Zuid-Holland were to be strengthened too. 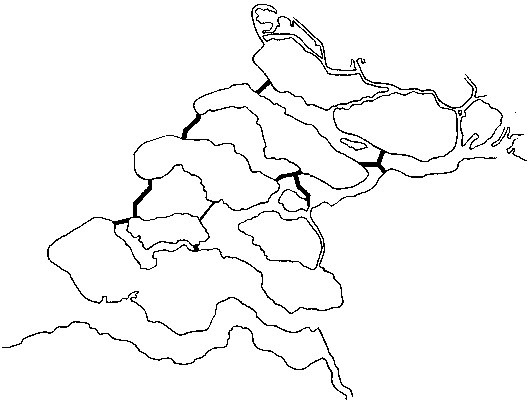 It was also decided to construct the Zeeland Route, a system of bridges and passable dykes linking islands otherwise difficult to reach, with the mainland. Things got under way with the so-called 'Three Islands Plan', joining Noord-Beveland with nearby Walcheren and Zuid-Beveland, so as to gain experience with the necessary new techniques and materials. The Haringvliet dam contains sluices used to discharge excess water from the Rhine into the sea.